The Los Angeles Raiders were coming off of two losses after a 2-0 start as they hosted the New York Jets on October 10, 1993. 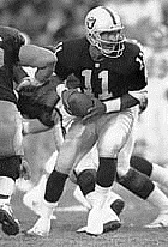 Coached by Art Shell, the Raiders had a new starting quarterback in Jeff Hostetler, formerly of the Giants, although he was bothered by a sprained ankle. The wide receiver corps was a good one with WR Tim Brown providing a steady target and unheralded rookie WR James Jett combining with Alexander Wright and Raghib “Rocket” Ismail to provide ample speed. The situation at running back was more of a concern. The Jets were also 2-2 and had lost the previous week in a game in which they blew a two-touchdown lead against Philadelphia. Head Coach Bruce Coslet’s team also had a new quarterback in Boomer Esiason, a solid tenth-year veteran obtained from the Bengals, and RB Johnny Johnson had been acquired from the Cardinals to boost the ground game. It was a hazy afternoon at the Memorial Coliseum with 41,627 fans in attendance. Starting from their own 20 after the opening kickoff, the Jets drove into Los Angeles territory. Boomer Esiason converted a third-and-11 play with a pass to WR Terance Mathis for 11 yards and a completion to WR Rob Moore picked up 39 yards to the LA 31. The advance finally stopped at the 12 yard line, but the visitors came up empty when punter/holder Louie Aguiar threw a pass that was intercepted by FS Eddie Anderson and returned 27 yards. Now it was the turn of the Raiders to put together a methodical series. Jeff Hostetler ran effectively and completed a third-and-10 pass to TE Ethan Horton for 11 yards. Another third down throw was complete to WR Tim Brown for 21 yards to the New York 12 but, after being backed up by a holding penalty, Hostetler’s pass intended for Horton was picked off by SS Brian Washington. The Jets had to punt on the final play of the first quarter, and Aguiar’s kick traveled 45 yards and went out of bounds at the LA 11. Hostetler fumbled on the next play and ex-Raider DT Bill Pickel recovered for New York. RB Blair Thomas ran for a six-yard touchdown and, with Cary Blanchard adding the extra point, the Jets were up by 7-0 at 11 seconds into the second quarter. Both teams went three-and-out and punted on their next possessions but an 18-yard Hostetler-to-Brown completion had the Raiders in New York territory. However, Hostetler’s next pass was intercepted by Washington and he returned it 62 yards for another TD for the Jets. Blanchard converted to put the visitors ahead by 14-0. 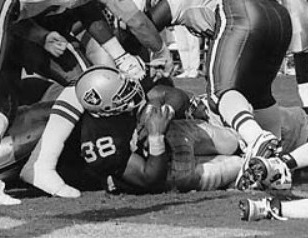 38-year-old Vince Evans (pictured at top), who had started in the previous week’s loss, relieved Hostetler at quarterback and it got no better for the Raiders when, on the next series, RB Greg Robinson fumbled and Pickel recovered at the LA 49. The Jets went 41 yards in seven plays as Esiason threw to Johnny Johnson for 16 yards and the Raiders were penalized for tripping. Blanchard kicked a 25-yard field goal. Down by 17-0 with 4:41 left in the first half, the Raiders drove 80 yards in six plays. RB Nick Bell carried three straight times for 18 yards and Evans threw to TE Andrew Glover for 20 more. Another pass was incomplete, but then Evans connected with James Jett for a 42-yard touchdown. Jeff Jaeger added the point and the halftime score was 17-7 as a Blanchard field goal attempt in the final seconds was blocked by Anderson. The Raiders had the first possession of the third quarter and it took them only two plays to narrow the margin further. Following a short run by Robinson, Evans threw to WR Alexander Wright on a play that covered 68 yards for a TD. Jaeger’s PAT made it a three-point game. On the next series, Esiason fumbled the ball away and LB Joe Kelly recovered at the New York 19. The Raiders lost yardage on the resulting short possession but Jaeger booted a field goal from 42 yards to tie the score. The teams exchanged punts and the Raiders moved from their 23 to the New York 14. Evans threw to Jett for 21 yards and carried the ball himself for 14. A short completion to WR Raghib Ismail followed by two Bell carries for 14 yards had the home team in the red zone, but LB Bobby Houston intercepted an Evans pass to end the threat. The score remained unchanged as the game headed into the fourth quarter and the Jets advanced just past midfield before having to punt. The Raiders punted in turn and New York methodically drove 56 yards in 13 plays. Esiason completed four passes, two of them to TE Johnny Mitchell and the longest covering 19 yards. But after getting a first-and-goal at the six, the visitors couldn’t reach the end zone and Blanchard kicked a 20-yard field goal that put them up by 20-17. Taking over on offense with 4:29 to play in regulation, Evans tossed two incomplete passes before connecting with Jett for 13 yards and a first down. Consecutive 14-yard completions to Ismail put the Raiders at the New York 31. A two-yard run by Bell was followed by an Evans throw to Jett for 10 yards and runs by Bell and Evans gained another 12 yards. Brown caught a pass for six yards and, with the clock down to seven seconds and LA having no more timeouts, the officials called a timeout to reset the clock, which had failed to run during the last play. Following the short break, Bell (pictured below) ran for the last yard in the 11-play, 72-yard drive for a touchdown. Jaeger’s extra point capped the 24-20 win for the Raiders. Los Angeles led in total yards (414 to 286) and had the edge in first downs (22 to 21). But the Raiders also turned the ball over five times, to two by the Jets, and were penalized eight times at a cost of 89 yards to five flags for 25 yards on New York. In his relief stint, Vince Evans completed 14 of 22 passes for 247 yards and two touchdowns while giving up one interception. Jeff Hostetler was pulled after going four-of 12 for 62 yards and two interceptions. Tim Brown had 5 catches for 66 yards and James Jett gained 86 yards on his four receptions that included a TD. Nick Bell topped the Raiders with 46 yards on 12 rushing attempts that included the game-winning score. Eddie Anderson accounted for an interception and a blocked kick on special teams. For the Jets, Boomer Esiason was successful on 21 of 40 throws for 216 yards with no TDs or interceptions. Johnny Johnson rushed for 56 yards on 16 attempts and led the club with 6 catches for 60 yards as well. On defense, Brian Washington (pictured at left) intercepted two passes, one of which was returned for a touchdown. The Raiders won the following week on the way to compiling a 10-6 record that placed second in the AFC West and qualified them for the postseason as a Wild Card. They defeated Denver in the first playoff round but lost at Buffalo in a Divisional contest. New York dropped to 2-4 before reeling off five straight wins, only to tail off late in the season. The Jets ended up at 8-8 and third in the AFC East. Jeff Hostetler returned to form as the season progressed and had a good one, passing for 3242 yards and 14 touchdowns against 10 interceptions. Vince Evans returned to the bench and, for the year, was successful on 45 of 76 throws for 640 yards and three TDs. 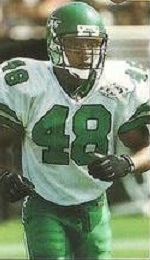 He spent another two seasons as a backup for the Raiders, finishing up his 15-year NFL career at age 40 in 1995 (Evans also played two seasons in the USFL).